These classes a a fusion of stretching, strengthening, balance, toning and even brain balancing. You'll get (4) 30 minute, (1) 35 minute, (1) 60 minute combo classes. BONUS! (3) 15 minute floor classes! Fun and effective classes you'll enjoy! Get access now for just $47! What Yoga Studios Don't Want You To Know About the "New Science" of stretching...and sculpting. Attn: Women Who Don't have the time to devote to exercise but really want to LOOK and feel fabulous! Yes! I'm ready to sculpt a beautiful body without having to learn complicated moves. Yes! I want to move my body in a way that feels wonderful and is easy to do (in a short amount of time) while delivering wonderful results. This "new science" has proven this three part prescription to be the most effective way to Sculpt YOUR best body! 2. With very specific sequences that work with YOUR body's stretch reflex, alignment and muscle activation. 3. Do these shorter workouts consistently. Yes...when you are using the latest scientific techniques, LESS working out will give you MORE results! These classes will help you do just that! Stretch and Sculpt is all of the things you expected to get out of yoga, pilates and even weight training, but without the difficult poses, the competition and the need to do it "right" ... instead of what is right for you. If you are ready to sculpt your best body, this class is for you! I Understand That When I Act Now, I get Instant Access to "Stretch and Sculpt Recorded Classes". These classes are designed to use the information gained from the new science to help you get results QUICKLY! But, when I act now,, I get instant access to everything for only $47! P.S. - Every minute you wait to get the "Stretch and Sculpt Recorded Classes" is another minute you will still be trying to get the results you are looking for the old fashioned way...working out too hard for too long! With little result to show for it! Put the power of "Stretch and Sculpt " to work for you so you can quickly and easily sculpt YOUR beautiful, healthy, lean body with less effort and time! P.P.S. - Don't just take my word for it... take a look at what other women just like you found when they put the power of these classes to work for them! Scroll below! "Toys" you will need for a few of the classes! Your Stretch and Sculpt Standing Classes! 45 min combo - 30 minutes of some great deep stretching. Lots of plies for leg strengthening and energy burning, jazz twists, box with arms at end, tapping hoes. Floor for full side series to melt away your side saddles! 30 minute. Warm up and onto an arm series, plies, torso twists, hoe downs to a different count. That was fun. If you have trouble following the new count...just keep moving and laugh. The brain loves new counts and laughter! You got this! 30 min using ball. Short stretch and off we went into a walk. Grab ball . No ball a pillow between your hands works. Squat to a calf/lower leg stretch with rotation series. More walking with brain/body work. 60 min combo (45 standing, 15 floor). Ball. This class was long so look at the box under here for full description. "Toys" you might want to use to do these classes! 16 minute floor class - Might want a hemorrhoid cushion or rolled towel. Seated twist stretch to extended linear stretch and onto our sides for side leg lifts. 16 min floor. Neck stretch, t-tapp twist. Extended linear stretch AND we stayed in that position to do it on each side. Onto the roll down. Bridge lift, frogs, ladybug stretch to the "Bug" herself. See what these women experienced from these classes! I love doing these classes! I have to enjoy the exercise classes I take or I know I won't do them. After just the first class, I know I've found my Trainer! Renee makes these classes fun and even when I am challenged by some of the moves, I know there is still a reason to do them and she always makes them fun. Renee not only teaches these classes, but she is always showing us ways to take these special movements and add them to our day. She calls it "fitting fitness into our day". These special moves have helped me feel better and I'm slowly losing inches. This is amazing since I"m 78 years old and a diabetic. Finally...I can see my waist again! I've done it all when it comes to exercise. Even though I would workout so hard a lot, I never really got the body toning results I wanted. Renee has proven to me that by slowing my moves down, used focus strengthening moves and relaxed more...results would come. She was right! I'm finally seeing my defined waist again and it's only been 2 weeks. I have never really enjoyed doing exercise classes before. I would start one and just get either bored if it was too easy or exhausted if they were too hard. These classes are "just right"! Love that I can get such great results and have a good time! Thanks for making these classes available to us where ever we are in the world. I'm on the other side of the ocean from you but can still take advantage of all the wisdom you have to offer. Inches dropped, pain reduced and depression lifted. All this with some classes! Renee McLaughlin is a health and somatic educator, speaker, motivator, and trainer with over 25 years of success stories from her clients. She has a Master of Science degree in Natural Health and is a certified Gentle Somatic Yoga Practitioner, Somatic Stretch Educator and T-Tapp Master Trainer. 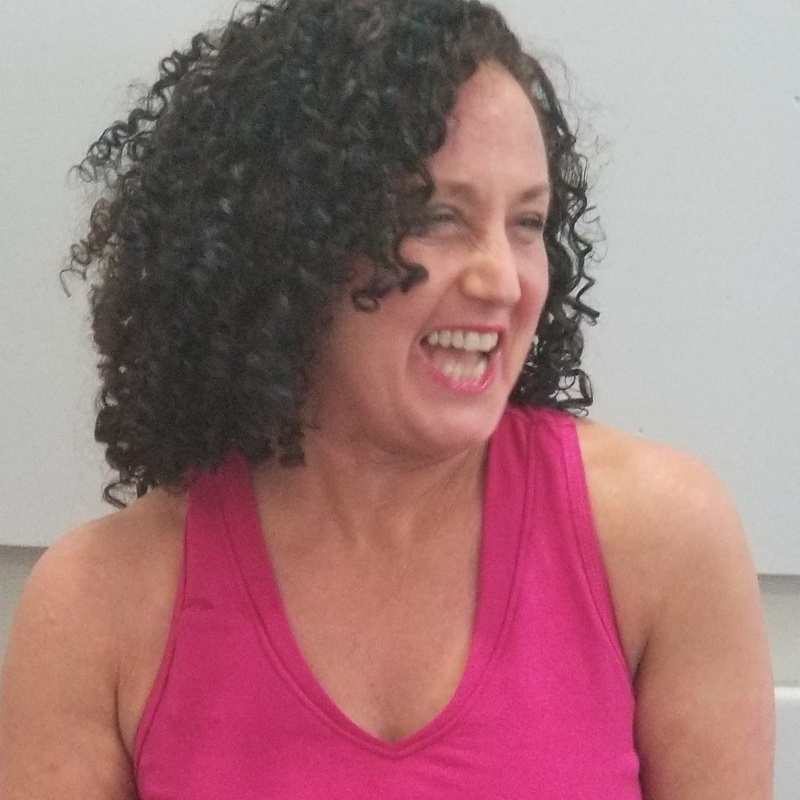 Renee is passionate about sharing her love of mindful movement and the power it has to help us get out of pain, increase flexibility and heal us at all levels...body, mind and even spirit!